L. Vanni, M. Ducoffe, D. Mayaffre, F. Precioso, D. Longrée, C. Aguilar, V. Elango, N. Santos, L. Galdo, J. Gonzalez, Text Deconvolution Saliency (TDS): a deep tool box for linguistic analysis, in 56th Annual Meeting of the Association for Computational Linguistics (ACL), Melbourne, Australia, July 2018. M. Ducoffe, F. Precioso, Adversarial Active Learning for Deep Networks: a Margin Based Approach, in arXiv, link to arXiv version. D. Mayaffre, C. Bouzereau, M. Ducoffe, M. Guaresi, F. Precioso, L. Vanni, Les mots des candidats, de « allons » à « vertu ». Pascal Perrineau. In Le vote disruptif. Les élections présidentielle et législatives de 2017, Presses SciencesPo, pp.129-152, 2017. L. F. Robert, N. Gros, Y. Noutary, L. Malleus, F. Precioso, D. Lingrand, Keypoint-based point-pair-feature for scalable automatic global registration of large rgb-d scans, U.S. Patent Application No. 15/368,351, 8 June 2017. K. Blanc, D. Lingrand, F. Precioso, Singlets: Multi-resolution Motion Singularities for Soccer Video Abstraction. In The Sports Workshop of IEEE Conference on Computer Vision and Pattern Recognition (CVPR), pp. 66-75, 2017. S. Lopez, A. Revel, D. Lingrand, F. Precioso, Handling noisy labels in gaze-based CBIR system. In International Conference on Advanced Concepts for Intelligent Vision Systems, pp. 396-405, September, 2017. L. Malleus, T. Fisichella, D. Lingrand, F. Precioso, N. Gros, Y. Noutary, L.F. Robert, L. Samoun, KPPF: Keypoint-Based Point-Pair-Feature for Scalable Automatic Global Registration of Large RGB-D Scans. In Proceedings of the IEEE International Conference on Computer Vision (ICCV),pp. 2495-2502, 2017. M. Ducoffe, F. Precioso, Active learning strategy for CNN combining batchwise Dropout and Query-By-Committee, in ESANN, Bruges, Belgium, April, 2017. M. Ducoffe, F. Precioso, Introducing Active Learning for CNN under the light of Variational Inference, in Openreview, link to openreview version. A. Al-Najdi, N. Pasquier, F. Precioso, Using Closed Patterns to Solve the Consensus Clustering Problem, to appear in the International Journal of Software Engineering and Knowledge Engineering (IJSEKE), 2016. M. Ducoffe, G. Portelli, F. Precioso, Scalable batch mode Optimal Experimental Design for Deep Networks, in NIPS workshop on the Future of Interactive Learning Machines, Barcelona, Spain, December, 2016. G. Portelli, M. Ducoffe, F. Lavigne, F. Precioso, Bio-inspired unsupervised pre-training of convolutional neural networks for image classification, in NIPS Workshop Brains & Bits, Barcelona, Spain, December, 2016. C. Camillieri, L. Parisi, M. Blay-Fornarino, F. Precioso, M. Riveill, J. Cancela Vaz, Towards a Software Product Line for Machine Learning Workflows: Focus on Supporting Evolution, in Proceedings of the ACM/IEEE 19th International Conference on Model Driven Engineering Languages and Systems, Workshop on Models and Evolution (ME), Saint Malo, France, October, 2016. A. Aly Halim, C. Dartigues-Pallez, F. Precioso, M. Riveill, A. Benslimane, S. Ghoneim, Human Action Recognition based-on 3D Skeleton Part-Based Pose Estimation and Temporal Multi-Resolution Aanalysis, in Proceedings of the IEEE International Conference on Image Processing (ICIP), Phoenix, Arizona, USA, September 25-28, 2016. A. Al-Najdi, N. Pasquier, F. Precioso, Using Frequent Closed Pattern Mining to Solve a Consensus Clustering Problem, in the 28th International Conference on Software Engineering & Knowledge Engineering (SEKE), California, USA, July 1-3, 2016. This paper has received the third place award. S. Lopez, A. Revel, D. Lingrand, F. Precioso, V. Dusaucy, A. Giboin, Catching relevance in one glimpse, in Proceedings of the ACM International Working Conference on Advanced Visual Interfaces (AVI), Bari, Italy, 7-10 June 2016. A. Al-Najdi, N. Pasquier, F. Precioso, Multiple Consensuses Clustering by Iterative Merging/Splitting of Clustering Patterns, in 12th International Conference on Machine Learning and Data Mining (MLDM 2016), proceedings in Springer LNCS, New-York, USA, July 16-21, 2016. M. Ducoffe, D. Mayaffre, F. Precioso, F. Lavigne, L. Vanni, A. Tre-Hardy, Machine Learning under the light of Phraseology expertise: use case of presidential speeches, De Gaulle - Hollande (1958-2016), in International Conference on the Statistical Analysis of Textual Data (JADT), Nice, France, 2016. A. Bouaziz, C. Dartigues-Pallez, C. da Costa Pereira, F. Precioso, Introducing Semantics in Short Text Classification, in 17th International Conference on Intelligent Text Processing and Computational Linguistics (CICLing 2016), proceedings in LNCS, Konya, Turkey, April 3-9, 2016. A. Al-Najdi, N. Pasquier, F. Precioso, Frequent Closed Patterns Based Multiple Consensus Clustering, in International Conference on Artificial Intelligence and Soft Computing (ICAISC 2016), proceedings in Springer LNAI, Zakopane, Poland, June 12-16, 2016. A. Bouaziz, C. Dartigues-Pallez, C. da Costa Pereira, F. Precioso, Interactive Generic Learning Method (IGLM): A New Approach to Interactive Short Text Classification, in the 31st ACM/SIGAPP Symposium on Applied Computing (SAC 2016), Pisa, Italy, April 4-8, 2016. M. Veta, P.J. van Diest, S.M. Willems, H. Wang, A. Madabhushi, A. Cruz-Roa, F.A. González, A. Boesen Lindbo Larsen, J.S. Vestergaard, A.B. Dahl, D.C. Ciresan, J. Schmidhuber, A. Giusti, L.M. Gambardella, F. Boray Tek, T. Walter, C.-W. Wang, S. Kondo, B.J. Matuszewski, F. Precioso, V. Snell, J. Kittler, T. Emidio de Campos, A. Mujahid Khan, N.M. Rajpoot, E. Arkoumani, M.M. Lacle, M.A. Viergever, J.P.W. Pluim, Assessment of algorithms for mitosis detection in breast cancer histopathology images, in Medical Image Analysis 20(1): 237-248, 2015. C. Spampinatto, S. Palazzo, P.-H. Joalland, S. Paris, H. Glotin, K. Blanc, D. Lingrand, F. Precioso, Fine-Grained Object Recognition in Underwater Visual Data, in Machine Graphics and Vision (MGV), Springer, 2015. S. Lopez, A. Revel, D. Lingrand, F. Precioso, One gaze is worth ten thousand (key-)words, in Proceedings of the IEEE International Conference on Image Processing (ICIP), Québec, Canada, 27-30 September 2015. X. Wang, D. Kumar, N. Thome, M. Cord, F. Precioso, Recipe Recognition with Large Multimodal Food Dataset, in Workshop Cooking and Eating Activities, IEEE ICME, 2015. A. Lechervy, P.H. Gosselin, F. Precioso, Boosted kernel for image categorization, in Multimedia Tools and Applications (MTAP), (2014), 69(2): 471-490, 2014. L. Meziou, A. Histace, F. Precioso, O. Romain, X. Dray, B. Granado, B. Matuszewski, Computer-Assisted Segmentation of Videocapsule Images Using Alpha-Divergence-Based Active Contour in the Framework of Intestinal Pathologies Detection, in International Journal of Biomedical Imaging (2014), 2014. V.F. Mota, E.A. Perez, M.B. Vieira, L.M. Maciel, F. Precioso, P.H. Gosselin, A tensor motion descriptor based on histograms of gradients and optical flow, In Pattern Recognition Letters. Volume 39, Pages 85-91, April 2014. L. Meziou, A. Histace, F. Precioso, Statistical Region-Based Active Contour Using Optimization of Alpha-Divergence Family For Image Segmentation, in 21 st International Conference on Image Processing (ICIP), Oct 2014, Paris, France. pp.6066- 6070, 2014. K. Blanc, D. Lingrand, F. Precioso, Fish Species Recognition from Video using SVM Classifier, in Proceedings of the ACM Workshop on Multimedia Analysis for Ecological Data (MAED), in conjunction with ACM Multimedia, pages 1-6, ACM, Orlando, Florida, US, 7th nov 2014. A. Bouaziz, C. Dartigues-Pallez, C. da Costa Pereira, F. Precioso, Patrick Lloret, Short Text Classification Using Semantic Random Forest, in Data Warehousing and Knowledge Discovery (DaWaK), pp. 288-299, 2014. H.A. Kirisli, M. Schaap, C.T. Metz, A.S. Dharampal, W.B. Meijboom, S.L. Papadopoulou, A. Dedic, K. Nieman, M.A. de Graaf, M.F.L. Meijs, M.J. Cramer, A. Broersen, S. Cetin, A. Eslami, L. Flórez-Valencia, K.L. Lor, B. Matuszewski, I. Melki, B. Mohr, I. Öksüz, R. Shahzad, C. Wang, P.H. Kitslaar, G. Unal, A. Katouzian, M. Orkisz, C.M. Chen, F. Precioso, L. Najman, S. Masood, D. Ünay, L. van Vliet, R. Moreno, R. Goldenberg, E. Vuçini, G.P. Krestin, W.J. Niessen, T. van Walsum, Standardized evaluation framework for evaluating coronary artery stenosis detection, stenosis quantification and lumen segmentation algorithms in computed tomography angiography, in Medical Image Analysis, 17:(8), pp. 859-876, 2013. Y. Zhang, B. Matuszewski, A. Histace, F. Precioso, Statistical Model of Shape Moments with Active Contour Evolution for Shape Detection and Segmentation, in Journal of Mathematical Imaging and Vision, 47:(1), pp. 35-47, 2013. A. Histace, L. Meziou, B. Matuszewski, F. Precioso, M. Murphy, F. Carreiras, Statistical region based active contour using a fractional entropy descriptor: Application to nuclei cell segmentation in confocal microscopy images, in Annals of British Machine Vision Association, 2013:(5), pp. 1-15, 2013. J. Benois-Pineau, F. Precioso, M. Cord, Visual Indexing and Retrieval, Series: SpringerBriefs in Computer Science, 2012, ISBN 978-1-4614-3587-7, May, 2012. R. Pighetti, D. Pallez, F. Precioso, Hybdrid Content Based Image Retrieval combining multi-objective interactive genetic algorithm and SVM, in Proceedings of IAPR ICPR 2012, pp. 2849-2852, 2012. M. Duval, E. Ouzeau, F. Precioso, B. Matuszewski, Coronary Artery Stenoses Detection with Random Forest, in Coronary artery stenosis detection & Quantification Challenge, MICCAI’2012, 2012. L. Meziou, A. Histace, F. Precioso, B. Matuszewski and F. Carreiras, Fractional Entropy Based Active Contour Segmentation of Cell Nuclei in Actin-Tagged Confocal Microscopy Images, in Conference on Medical Image Understanding and Analysis (MUIA), Swansea (UK), 2012 (Best student paper award). A. Lechervy, P.H. Gosselin and F. Precioso, Linear kernel combination using boosting, in European Symposium on Artificial Neural Networks, Computational Intelligence and Machine Learning (ESANN '12), Bruges, Belguim, April 2012. L. Meziou, A. Histace and F. Precioso, Alpha-divergence maximization for active contour based image segmentation with non-parametric PDF estimations, in IEEE International Conference on Accoustic, Speech Signal Processing (ICASSP'12) Kyoto (Japan), March 2012. L. Meziou, A. Histace, F. Precioso, B. Matuszewski and F. Carreiras, 3D Confocal Microscopy data analysis using level-set segmentation with alpha-divergence similarity measure, in VISAPP'12 (International Conference on Computer Vision Theory and Applications), Rome (Italia), February 2012. V.F. Mota, E.A. Perez, M.B. Vieira, L.M. Maciel, F. Precioso, P.H. Gosselin, A tensor based on optical flow for global description of motion in videos, IEEE SIBGRAPI Conference on Graphics, Patterns and Images, 2012. R. Negrel, V. Fernandes Mota, P.H. Gosselin, M. Bernardes Vieira, F. Precioso, Indexation des Bases Vidéos à l'aide d'une Modélisation du Flot Optique par Bases de Polynômes, in RFIA, Lyon, 2012. M. Boufarguine, N. Thome, V. Guitteny, F. Precioso, Suivi 3D Monoculaire pour un Système de Vidéosurveillance à l'aide d'un Modèle de Mouvement et un Modèle d'Apparence, in RFIA, Lyon, 2012. P-H Gosselin, F. Precioso, S. Philipp-Foliguet, Incremental Kernel Learning for Active Image Retrieval without Global Dictionaries, in Elsevier, Pattern Recognition, Special Issue on Semi-Supervised Learning, 44, 10-11 (October 2011), 2343-2357. D. Gorisse, M. Cord, F. Precioso, SALSAS : Sub-linear Active Learning Strategy with Approximate k-NN Search, in Elsevier, Pattern Recognition, Special Issue on Semi-Supervised Learning, 44, 10-11 (October 2011), 2244-2254. S. Zhao, F. Precioso, M. Cord, Spatio-Temporal Tube data representation and Kernel design for SVM-based video object retrieval system, in Springer Journal on Multimedia Tools and APplications (MTAP), Special Issue on Image and Video Retrieval: Theory and Applications, 55:(1), 105-125, October 2011. Y. Zhang, B. Matuszewski, A. Histace and F. Precioso, Statistical Shape Model of Legendre Moments with Active Contour Evolution for Shape Detection and Segmentation, in IAPR International Conference on Computer Analysis of Images and Patterns, Part I. Lecture Notes in Computer Science 6854 Springer, Seville (Spain), 29-31 August 2011, pp. 51-58. L. Meziou, A. Histace, F. Precioso and B. Matuszewski, Confocal Microscopy Segmentation Using Active Contour Based on Alpha-Divergence, in IEEE International Conference on Image Processing (IEEE ICIP 2011), Bruxelles (Belgique), September 2011, pp. 3077-3080. B. Matuszewski, M. Murphy, D. Burton, T. Marchant, C. Moore, A. Histace and F. Precioso, Segmentation of Cellular Structures in Actin Tagged Fluorescence Confocal Microscopy Images, in IEEE International Conference on Image Processing (IEEE ICIP 2011), Bruxelles (Belgique), September 2011. L. Meziou, A. Histace, F. Precioso and B. Matuszewski, MRI segmentation using histogram based active contour method: application to prostate MR image analysis, in International Journal of Computer Assisted Radiology and Surgery, Proceedings of 25th Congress CARS 2011 (Computer Assisted Radiology and Surgery), Berlin (Germany), June 2011. L. Meziou, A. Histace, F. Precioso and B. Matuszewski, Alpha-divergences pour la segmentation par contours actifs basés histogramme : application à la segmentation d'images cellulaires en microscopie confocale tridimensionnelle, in GRETSI 2011, Bordeaux, France, Sept. 2011. Y. Zhang, B. J. Matuszewski, A. Histace, F. Precioso, J. Kilgalon, C. Moore, “Boundary Delineation in Prostate Imaging using Active Contour Segmentation Method with Interactively Defined Object Regions”, in Workshop Prostate Cancer Imaging (MICCAI 2010), Beijing, China, Sep. 2010. D. Gorisse, M. Cord, F. Precioso, Scalable active learning strategy for object category retrieval, in IEEE International Conference on Image Processing (ICIP '10), Hong-Kong, Oct. 2010. S. Zhao, F. Precioso, M. Cord, STTK-based Video Object Recognition, in IEEE International Conference on Image Processing (ICIP '10), Hong-Kong, Oct. 2010. A. Lechervy, P-H Gosselin, F. Precioso, Active Boosting for Interactive Object Retrieval, in IAPR International Conference on Pattern Recognition (ICPR '10), Istanbul ,Turkey, Aug. 2010. M. Boufarguine, M. Baklouti, F. Precioso, V. Guitteny, Virtu4D: a Realtime Virtualization of Reality, in International Symposium on 3D Data Processing Visualization and Transmission (3DPVT '10), 2010, Paris. A. Lechervy, P.-H. Gosselin, F. Precioso, Boosting actif pour la recherche interactive d’images, RFIA 2010, Caen, Jan. 2010. D. Gorisse, M. Cord, F. Precioso, Optimization on active learning strategy for object category retrieval, in IEEE International Conference on Image Processing (ICIP 09), Cairo, Egypt, Nov. 2009. S. Zhao, F. Precioso, M. Cord, Spatio-Temporal Tube Kernel for Actor Retrieval, in IEEE International Conference on Image Processing (ICIP 09), Cairo, Egypt, Nov. 2009. J.-E. Haugeard, S. Philipp-Foliguet, F. Precioso , Windows and Facades Retrieval using Similarity on Graph of Contours, in IEEE International Conference on Image Processing (ICIP 09), Cairo, Egypt, Nov. 2009. J.-E. Haugeard, S. Philipp-Foliguet, F. Precioso, J. Lebrun , Extraction of Windows in facade using Kernel on Graph of Contours, in IAPR 16th Scandinavian Conference on Image Analysis (SCIA), Oslo, Norvège, June 2009. A.Devaux, N. Paparoditis, F. Precioso, B. Cannelle, Accurate Face Detection for Privacy in Street-view Mapping Applications Combining Face Boosting, Body Boosting and Skin Tone Detectors, in IAPR Conference on Machine Vision Applications (MVA), Yokohama (Japan), May 2009. M. Breuilly, A. Histace, C. Portefaix, B. Matuszewski, F. Precioso, Segmentation des muscles oculomoteurs en IRM cérébro-orbitaire pour l’aide au diagnostic de l’exophtalmie, in 22ème colloque GRETSI, Sep. 2009. S. Zhao, F. Precioso, M. Cord and S. Philipp-Foliguet, Actor retrieval system based on kernels on bags of bags, in EUSIPCO, Lausanne (Switzerland), Aug. 2008. D. Gorisse, M. Cord, F. Precioso, S. Philipp-Foliguet, Fast Approximate Kernel-based Similarity Search for Image Retrieval Task, in 19th IAPR International Conference on Pattern Recognition (ICPR), Tampa (Florida, USA), Dec. 2008. D. Gorisse, F. Precioso, M. Cord, S. Philipp-Foliguet, Summarization Sheme Based on Near-duplicate Analysis, in ACM International Conference on Multimedia, in Proceedings of TVS'2008, page(s): 50 – 54 Vancouver, British Columbia, (Canada), Nov. 2008. G. Quenot, J. Benois-Pineau, B. Mansencal, E. Rossi, M. Cord, D. Gorisse, F. Precioso, P. Lambert, B. Augereau, L. Granjon, D. Pellerin, M. Rombaut, S. Ayache, Rushes summarization by IRIM consortium: redundancy removal and multi-feature fusion, in ACM International Conference on Multimedia, in Proceedings of TVS'2008, page(s): 80 – 84, Vancouver, British Columbia, (Canada), Nov. 2008. 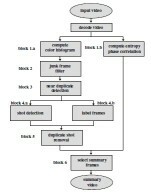 G. Camara Chavez, F. Precioso, M. Cord, S. Philipp-Foliguet, A. de Albuquerque Araujo, An interactive video content-based retrieval system, in IEEE and EURASIP IWSSIP 2008, Bratislava (Slovaquia), page(s): 133 – 136, June 2008. G. Camara Chavez, F. Precioso, M. Cord, S. Philipp-Foliguet, A. de Albuquerque Araujo, Shot boundary detection by a hierarchical supervised approach, in IEEE and EURASIP IWSSIP 2007, Maribor (Slovenia), page(s): 197 – 200, June 2007. D. Gorisse, M. Cord, M. Jordan, S. Philipp-Foliguet, F. Precioso, 3D Content-Based Retrieval in Artwork Databases, in IEEE 3DTV-Conference, Kos (Greece), page(s):1 – 4 May 2007. J. Gony, M. Cord, S. Philipp-Foliguet, P.H. Gosselin, F. Precioso, and M. Jordan, RETIN: a smart interactive digital media retrieval system, in Proceedings of the 6th ACM international conference on Image and video retrieval (CIVR '07), 2007. G. Camara-Chavez, M. Cord, S. Philipp-Foliguet, F. Precioso, A. Albuquerque de Araújo., Robust Scene Cut Detection by Supervised Learning, in EUSIPCO, Florence (Italy), Sep. 2006. G. Camara Chavez, M. Cord, F. Precioso, S. Philipp-Foliguet, A. de Albuquerque Araujo, Video segmentation by supervised learning, in IEEE SIBGRAPI 2006, Manaus (Brazil), page(s): 365 – 372, Oct. 2006. F. Precioso, M. Barlaud, T. Blu, M. Unser, Robust Real-Time Segmentation of Images and Videos Using a Smoothing-Spline Snake Based Algorithm, in IEEE Trans on Image Processing, Vol. 14(7), page(s): 910 – 924, July 2005. N. Voisine, S. Dasiopoulou, F. Precioso, V. Mezaris, I. Kompatsiaris and M.G. Strintzis, A Genetic Algorithm-based Approach to Knowledge-assisted Video Analysis, in IEEE International Conference on Image Processing (ICIP), Vol. 3, page(s): III- 441–4, Genova (Italy), Sep. 2005. T. Athanasiadis, V. Tzouvaras, K. Petridis, F. Precioso, Y. Avrithis and I. Kompatsiaris, Using a Multimedia Ontology Infrastructure for Semantic Annotation of Multimedia Content, in 5th International Workshop on Knowledge Markup and Semantic Annotation (SemAnnot 2005) at the 4th International Semantic Web Conference, ISWC 2005, Galway (Ireland), Nov. 2005. K. Petridis, F. Precioso, T. Athanasiadis, Y. Avrithis and I. Kompatsiaris, Combined Domain Specific and Multimedia Ontologies for Image Understanding, in Workshop on Mixed-reality as a Challenge to Image Understanding and Artificial Intelligence at the 28th German Conference on Artificial Intelligence, KI 2005, Koblenz (Germany), Sep. 2005. S. Jehan-Besson, M. Gastaud, F. Precioso, M. Barlaud, G. Aubert, and E. Debreuve, From snakes to region-based active contours defined by region dependent parameters, in Applied Optics: Information Processing, Vol.43 (2), page(s): 247 – 256, Jan. 2004. F. Precioso, M. Barlaud, B-Spline Active Contour with Handling of Topological Changes for fast Video Segmentation, in EURASIP Journal on Applied Signal Processing, special issue on Image Analysis for Multimedia Interactive Services - Part II, Vol.2002 (6), page(s): 555 – 560, June, 2002. F. Precioso, M. Barlaud, T. Blu, M. Unser, Smoothing B-Spline Active Contour for Fast and Robust Image and Video Segmentation, in ICIP 2003, IEEE International Conference on Image Processing (ICIP), Vol. 1, page(s): I – 137 - 40, Barcelona (Spain), Sep. 2003. F. Precioso, M. Barlaud, Regular Spatial B-Spline Active Contours for Fast Video Segmentation, in ICIP 2002, IEEE International Conference on Image Processing, Rochester (NY), page(s): 761 – 764, Sep. 2002. F. Precioso, M. Barlaud, B-Spline Active Contour for Fast Video Segmentation, in ICIP 2001, IEEE International Conference on Image Processing, Thessaloniki (Greece), page(s): 777 – 780, Oct. 2001. F. Precioso, M. Barlaud, B-Spline Active Contour for Fast Video Segmentation, in WIAMIS 2001,Workshop on Image Analysis for Multimedia Interactive Services, Tampere (Finland), page(s): 47 – 51, May 2001. F. Precioso,Parametric active contours for image and video segmentation, PhD dissertation, Université de Nice Sophia Antipolis, September 2004. Zhao S., Precioso F., and Cord M.
In: Springer Journal on Multimedia Tools and APplications (MTAP), special issue onImage and Video Retrieval: Theory and Applications", to appear in 2011. In this article, we propose a new video object retrieval system. Our approach is based on a Spatio-Temporal data representation, a dedicated kernel design and a statistical learning toolbox for video object recognition and retrieval. Using state-of-the-art video object detection algorithms (for faces or cars, for example) we segment video object tracks from real movies video shots. We then extract, from these tracks, sets of spatio-temporally coherent features that we call Spatio-Temporal Tubes. To compare these complex tube objects, we design a Spatio-Temporal Tube Kernel (STTK) function. Based on this kernel similarity we present both supervised and active learning strategies embedded in Support Vector Machine framework. Additionally, we propose a multi-class classification framework dealing with unbalanced data. Our approach is successfully evaluated on two real movies databases, the french movieL'esquive" and episodes fromBuffy, the Vampire Slayer" TV series. Our method is also tested on a car database (from real movies) and shows promising results for car identification task. In: IAPR International Conference on Pattern Recognition(ICPR), Istanbul ,Turkey, Aug. 2010. This paper presents a new algorithm based on boosting for interactive object retrieval in images. Recent works propose ”online boosting” algorithms where weak classifier sets are iteratively trained from data. These algorithms are proposed for visual tracking in videos, and are not well adapted to ”online boosting” for interactive retrieval. We propose in this paper to iteratively build weak classifiers from images, labeled as positive by the user during a retrieval session. A novel active learning strategy for the selection of images for user annotation is also proposed. This strategy is used to enhance the strong classifier resulting from ”boosting” process, but also to build new weak classifiers. Experiments have been carried out on a generalist database in order to compare the proposed method to a SVM based reference approach. In: International Symposium on 3D Data Processing Visualization and Transmission (3DPVT), 2010, Paris. In video surveillance systems, when dealing with dynamic complex scenes, processing the information coming from multiple cameras and fusing them into a comprehensible environment is a challenging task. This work addresses the issue of providing a global and reliable representation of the monitored environment aiming at enhancing the perception and minimizing the operator’s effort. The proposed system Virtu4D is based on 3D computer vision and virtual reality techniques and takes benefit from both the ”real” and the ”virtual” worlds offering a unique perception of the scene. This paper presents a short overview of the framework along with the different components of the design space: Video Model Layout, Video Processing and Immersive Model Generation. The final interface gathers the 2D information in the 3D context but also offers a complete 3D representation of the dynamic environment allowing a free intuitive 3D navigation. In: IEEE International Conference on Image Processing, Cairo, Egypt, Nov. 2009. The development of street-level geoviewers become recently a very active and challenging research topic. In this context, the detection, representation and classification of windows can be beneficial for the identification of the respective facade. In this paper, a novel method for windows and facade retrieval is presented. This method, based on a similarity of graph of contours, introduces a new kernel on graph for inexact graph matching. We design a kernel similarity function for structured sets of contours which will take into account the variations of contour orientation inside a structure set, as well as spatial proximity. Then we are able to extract a window as a sub-graph of the graph of all contours of the facade image and to retrieve similar windows from a database of images of facades. Active learning is a framework that has attracted a lot of research interest in the content-based image retrieval (CBIR) in recent years. To be effective, an active learning system must be fast and effecient using as few feedback iterations as possible. Scalability is the major problem for that online learning method, since the complexity of such methods on a database of size n is in the best case O(n log(n)). In this article we propose a strategy to overcome that limitation. Our technique exploits ultra fast retrieval methods like LSH, recently applied for unsupervised image retrieval. Combined with active selection, our method is able to achieve very fast active learning task in very large database. Experiments on VOC2006 database are reported, results are obtained four times faster while preserving the accuracy. In: IAPR Conference on Machine Vision Applications (MVA), Yokohama (Japan), May 2009. In the last two years, web-based applications using street-level images have been developing fast. In that context, privacy preservation is an unavoidable issue. We present in this paper a multi-boosting based approach to detect pedestrians in high resolution panoramics in order to blur their faces. This task is quite complex since these features vary in size, shape, color, and often are partially occluded, sometimes behind windows or inside cars, etc. Our strategy is thus based on the combination of two existing boosting algorithms detecting faces  and bodies  with a skin tone detection algorithm we developed. The results are quite encouraging for such an unconstrained data: 86:2% of true positives and an average of 2 false positive detections per image (2.1 MPixels). This combination solution provides much more robust results than each detection algorithm performed independently. In content based image retrieval, the success of any distance-based indexing scheme depends critically on the quality of the chosen distance metric. We propose in this paper a kernel-based similarity approach working on sets of vectors to represent images. We introduce a method for fast approximate similarity search in large image databases with our kernel-based similarity metric. We evaluate our algorithm on image retrieval task and show it to be accurate and faster than linear scanning. In: ACM International Conference on Multimedia, Vancouver, Canada, November 2008. This paper presents our approach to select relevant sequences from raw videos in order to generate summaries to Trecvid 2008 BBC Rush Task. Our system is composed of two major steps: First, the system detects \semantic" shot boundaries and keeps only non-redundant shots; then, the system estimates average motion for each shot, as a criterion of amount of information, to better share out the duration of the summary between remaining shots. The first step is based on a fast near-duplicate retrieval using Locality Sensitive Hashing (LSH) which provides results in few seconds (if we do not take into account decoding and encoding processes). The evaluation of Trecvid shows very promising results, since we ranked 17th over 43 runs, regarding redundancy measure (RE), and 18th for object and event inclusion (IN). These balanced results (most of best teams for the first criterion are among the latest for the second one) show that our method offers a quite good trade-off between false negatives (IN) and false positives (RE). In: IEEE 3DTV-Conference, Kos Island, Greece, may 2007. In this paper, we present first results obtained in the frame of the EROS-3D project, which aims at dealing with a collection of artwork 3D models, i.e. visualize them, classify them and compare them. Some 3D descriptors are used, in association with our active learning search engine RETIN. 3D features are described as well as our new system of classification and retrieval of objects, which we called RETIN-3D. In: EUSIPCO, Firenze, Italy, sept. 2006. The first step for video-content analysis, content-based video browsing and retrieval is the partitioning of a video sequence into shots. A shot is the fundamental unit of a video, it captures a continuous action from a single camera and represents a spatio-temporally coherent sequence of frames. Thus, shots are considered as the primitives for higher level content analysis, indexing and classification. Although many video shot boundary detection algorithms have been proposed in the literature, in most approaches, several parameters and thresholds have to be set in order to achieve good results. In this paper, we present a robust learning detector of sharp cuts without any threshold to set nor any pre-processing step to compensate motion or post-processing filtering to eliminate false detected transitions. The experiments, following strictly the TRECVID 2002 competition protocol, provide very good results dealing with a large amount of features thanks to our kernel-based SVM classifier method. In: 5th International Workshop on Knowledge Markup and Semantic Annotation (SemAnnot 2005) at the 4th International Semantic Web Conference, ISWC 2005, Galway, Ireland, Nov. 2005. In this paper we discuss the use of knowledge for the automatic extraction of semantic metadata from multimedia content. For the representation of knowledge we extended and enriched current general-purpose ontologies to include low-level visual features. More specifically, we implemented a tool that links MPEG-7 visual descriptors to high-level, domain-specific concepts. For the exploitation of this knowledge infrastructure we developed an experimentation platform, that allows us to analyze multimedia content and automatically create the associated semantic metadata, as well as to test, validate and refine the ontologies built. We pursued a tight and functional integration of the knowledge base and the analysis modules putting them in a loop of constant interaction instead of being the one just a pre- or post-processing step of the other. In: ICIP 2005, IEEE International Conference on Image Processing, Genova, September 2005. Efficient video content management and exploitation requires extraction of the underlying semantics, a non-trivial task associating low-level features of the image domain and highlevel semantic descriptions. In this paper, a knowledge-assisted approach for extracting semantics of domain-specific video content is presented. Domain knowledge considers both low-level features (color, motion, shape) and spatial behavior (topological and directional information). During the preprocessing step, a set of over-segmented homogenous atom-regions is generated and their low-level and spatial descriptions are extracted. A genetic algorithm is then applied in order to find the optimal interpretation according to a specific domain conceptualization. The proposed approach was tested on the Formula One, Tennis and beach vacations domains showing promising results. In: Workshop on Mixed-reality as a Challenge to Image Understanding and Artificial Intelligence at the 28th German Conference on Artificial Intelligence, KI 2005, Koblenz, Germany, Sep. 2005. Knowledge representation and annotation of multimedia documents typically have been pursued in two different directions. Previous approaches have focused either on low level descriptors, such as dominant color, or on the content dimension and corresponding manual annotations, such as person or vehicle. In this paper, we present a knowledge infrastructure to bridge the gap between the two directions. Ontologies are being extended and enriched to include low-level audiovisual features and descriptors. Additionally, a tool for linking low-level MPEG-7 visual descriptions to ontologies and annotations has been developed. In this way, we construct ontologies that include prototypical instances of domain concepts together with a formal specification of the corresponding visual descriptors. Thus, we combine high-level domain concepts and low-level multimedia descriptions, enabling for new media content analysis. Precioso F., and Barlaud M., and Blu T., and Unser M.
In: IEEE Trans on Image Processing, Vol. 14(7), page(s): 910 – 924, July 2005. This paper deals with fast image and video segmentation using active contours. Region based active contours using level-sets are powerful techniques for video segmentation but they suffer from large computational cost. A parametric active contour method based on B-Spline interpolation has been proposed in  to highly reduce the computational cost but this method is sensitive to noise. Here, we choose to re-lax the rigid interpolation constraint in order to robustify our method in the presence of noise: by using smoothing splines, we trade a tunable amount of interpolation error for a smoother spline curve. We show by experiments on natural sequences that this new flexibility yields segmentation results of higher quality at no additional computational cost. Hence real time processing for moving objects segmentation is preserved. Jehan-Besson S., and Gastaud M., and Precioso F., and Barlaud M., and Aubert G., and Debreuve E.
This synthetic paper deals with image and sequence segmentation when looking at the segmentation task from a criterion optimization point of view. Such a segmentation criterion involves so-called (boundary and region) descriptors which, in the general case, may depend on their respective boundary or region. This dependency must be taken into account when computing the criterion derivative with respect to the unknown object domain (defined by its boundary). If not, some correctional terms may be omitted. This article focuses computing the derivative of the segmentation criterion using a dynamic scheme. The presented scheme is general enough to provide a framework for a wide variety of applications in segmentation. It also provides a theoretical meaning to the active contour philosophy. This paper deals with video segmentation for MPEG- 4 and MPEG-7 applications. 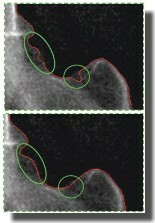 Region-based active contours is a powerful technique for segmentation. 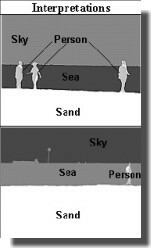 However most of these methods are implemented using level-sets. 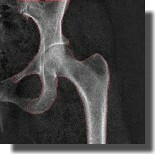 Although level-set methods provide accurate segmentation, they suffer from large computational cost. In this paper we propose to use a regular B-Spline parametric method to provide a fast and accurate segmentation. Our B-Spline interpolation is based on a fixed number of points 2j depending on the level of details desired. Through this spatial multi-resolution approach, the computational cost of the segmentation is reduced. We introduce a length penalty. This results in improving both smoothness and accuracy. Then we show some experiments on real video sequences. Active contour modeling represents the main framework of this thesis. Active contours are dynamic methods applied to segmentation of still images and video. The goal is to extract image regions corresponding to semantic objects. Image and Video segmentation can be cast in a minimization framework by choosing a criterion which includes region and boundary functionals. This minimization is achieved through the propagation of a region-based active contour. The efficiency of these methods lies in their robustness and their accuracy. The aim of this thesis is triple: to develop (i) a model of parametric curve providing a smooth active contour, to precise (ii) conditions of stable evolution for such curves, and to reduce (iii) the computation cost of our algorithm in order to provide an efficient solution for real time applications. We mainly consider constraints on contour regularity providing a better robustness regarding to noisy data. In the framework of active contour, we focus on stability of the propagation force, on handling topology changes and convergence conditions. We chose cubic spline curves. Such curves provide great properties of regularity, allow an exact computation for analytic expressions involved in the functional and reduce highly the computation cost. Furthermore, we extended the well-known model based on interpolating splines to an approximatingmodel based smoothing splines. This latter converts the interpolation error into increased smoothness—smaller energy of the second derivative. The flexibility of this new model provide a tunable balance between accuracy and robustness. The efficiency of implementating such parametric active contour spline-based models has been illustrated for several applications of segmentation process.